Imagine a hot air balloon ride in France. Floating majestically and effortlessly over châteaux, medieval villages and the picturesque countryside of rural France. 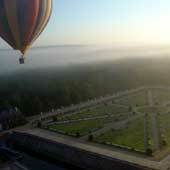 Hot air balloon flights can be enjoyed by everyone; individuals or groups. There are no particular age or physical requirements. Because a hot air balloon floats along with the wind there is little change in temperature, nor is there any wind chill factor. So no special clothing or equipment is necessary, only your camera! The hot air balloon takes off with the gentle breezes in the morning, approximately one hour after sunrise, or with the calm and stable winds in the evening two hours before sunset. All pilots are experienced, bilingual (English / French) professionals. 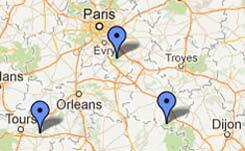 Flights take-off from three different locations in France every morning and afternoon from April through October. The entire event lasts for approximately 3 hours, of which one hour is spent flying in the hot air balloon. Take-off time is shortly after dawn or shortly before dusk, so the exact take-off hour depends on the time of year. You will be given a meeting time when your reservation is confirmed. In most cases, a Morning flight will require you to arrive at or near the location the day before. Flights are available from April - October. Read the Hot Air Balloon Terms for more information. Lift off just outside of Paris and discover the forests of Fontainebleau. 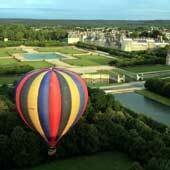 See the castles of the Loire Valley from above. 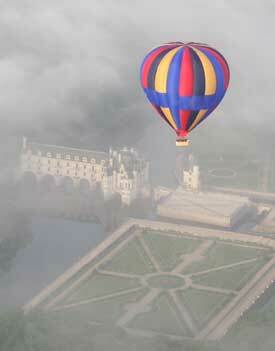 Lift off from Chenonceux. 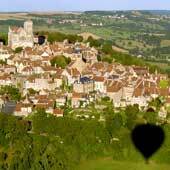 Fly over the castles and vineyards of the Burgundy wine region.